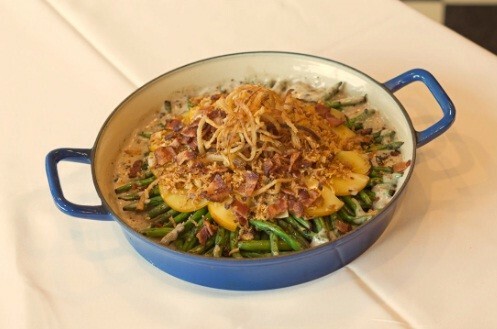 Chef John Fortin of the ROX Café in Newton, Mass, has created a green bean casserole recipe that just might make you forget about the traditional gluten-filled version. Add a touch of innovation to a classic side dish. 1. Preheat oven to 475° F. Slice onions into 1/8 -inch slices, pat dry and toss in a bowl with the flour, cornmeal and salt. 2. Coat a baking sheet with about half the oil and evenly spread the onions around the sheet. Drizzle the remaining oil evenly across the onions and bake until golden brown (about 25 to 30 minutes). Remove and reserve. 3. Lower the oven temperature to 350° F. Place green beans into a 1-quart casserole dish. 4. Sauté the bacon in a wide, deep skillet over medium heat until it is browned and crispy. Remove the bacon and place on paper towels to drain. Remove all but about 2 tablespoons of bacon fat from the skillet and add mushrooms. Cook (stirring constantly) for about four minutes or until tender. Stir salt and pepper into half-and-half. 5. Deglaze the pan by adding the half-and-half, making sure to stir and scrape the bacon bits from the bottom of the pan. Simmer on medium heat until thickened slightly, about 8 minutes. Pour this mixture over the green beans. 6. Fan smoked Gouda slices in a circle over the green beans and top with prepared onions. Crumble bacon evenly across the top. Bake for 20 minutes. Cooking time: 60 to 65 minutes. Check out the November/December 2013 issue of Gluten-Free Living for John Fortin’s complete holiday menu.